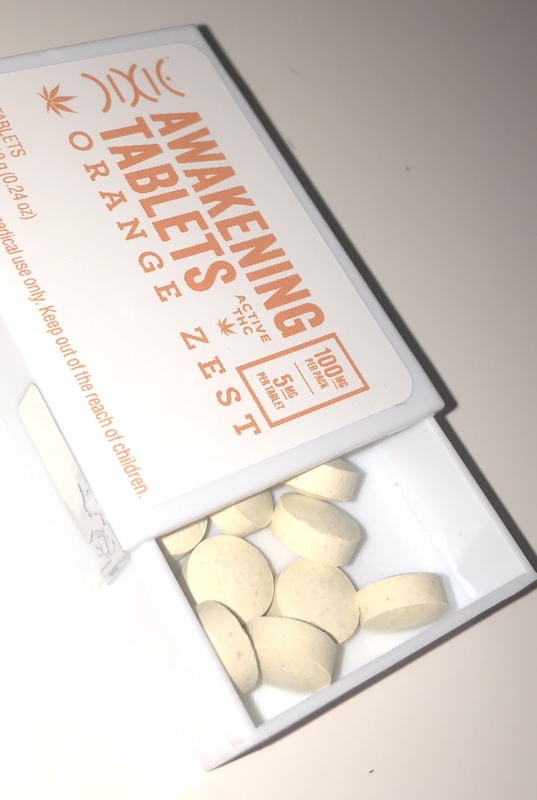 Today we’re gonna talk about the Dixie Awakening Orange Zest Tablets, or as I like to call ’em, my weed pills. Hooray! We reviewed the Dixie Elixir Half & Half last June, which is licensed in Maryland by Curio Wellness, and found it effective, if not cost-effective for folks with a high tolerance like myself. However! I have been refining my method for consuming edibles and I’ve come up with a solution that consistently produces positive results. If I try to take edibles within an hour or two of a full meal (generally advisable before ingesting any drug), I get bupkis, nilch, zero, even at relatively high dosages. I have to really, really overdo it, and then when it kicks in, it knocks me out. As a consequence, I began to avoid edibles, cuz Dobby is a very busy elf, but this is no longer an acceptable solution, cuz they’re really quite popular and also I moved into a new spot in Baltimore and if I get a note under my door about the weed smell I’m gonna go into a posilute tizzy. I am trying very hard to be cool and under the radar this go ’round. I have, on rare occasion, been known to learn from my mistakes. Eventually. But like I said, I’ve got a new trick this time. If I have a little something to eat- a CLIF bar, some peanut butter crackers, something small- or if it’s been long enough since my last meal that I’m beginning to feel a bit peckish, I can get edibles to work, even at low doses, no matter the time of day. If I have nothing on my stomach, it doesn’t usually work. Carbonated drinks seem to negatively affect whether an edible works or not, also, so best to avoid them entirely. I’d like to reiterate that this method is for folks that haven’t had much success with edibles in the past. If you’re just starting out, please please please treat the medicine with respect. Eat something first and titrate slowly, which is a word I know, and have used correctly, and would like some recognition for. A high-five, perhaps? Ah, yes. Thank you. We can now continue. So that’s how we got edibles back on the menu. We’re still looking at the pass/fail “does this product replace the need to smoke,” but at smaller doses, and we’re looking beyond that for something to help us function the way flowers and dabs do. The Gentleman has run the Dixie Awakening Orange Zest Tablets through several trials. Each tablet, or weed pill, is 5mg. I have ingested, on separate days, 15, 20, 25, and 30mg. Onset is relatively quick. I recorded the 30mg dose at 6:19pm and could feel the effects starting at 6:35pm, so roughly 15 minutes that time, which is very impressive. Expect between that and a half-hour. After the 15mg dose, I went to jog on the treadmill downstairs and felt the Dixie tablets kick in on the back half of my run. Suddenly my mood was up, I had energy to spare, and my abstract visualization improved. I could see the goal in my mind’s eye and ran toward it with vigor. I also left my keys in the machine and had to ask a kind neighbor to let me back into the room. The mood boost stuck around for about an hour, got some good stretching in, then it was time to smoke. The 30mg trial was a bit of a ride. My notes after onset read “7:46pm comedown hungry?” followed by “8:15pm hungry nauseous,” followed by a small cheese pizza, followed by “10pm comedown.” So clearly I was hungry before I acknowledged it and definitely was not coming down (remember earlier about it not working well on an empty stomach? ), but it did outlast the meal that time by an hour plus. Total time from onset to comedown was 3 hours, 25 minutes. 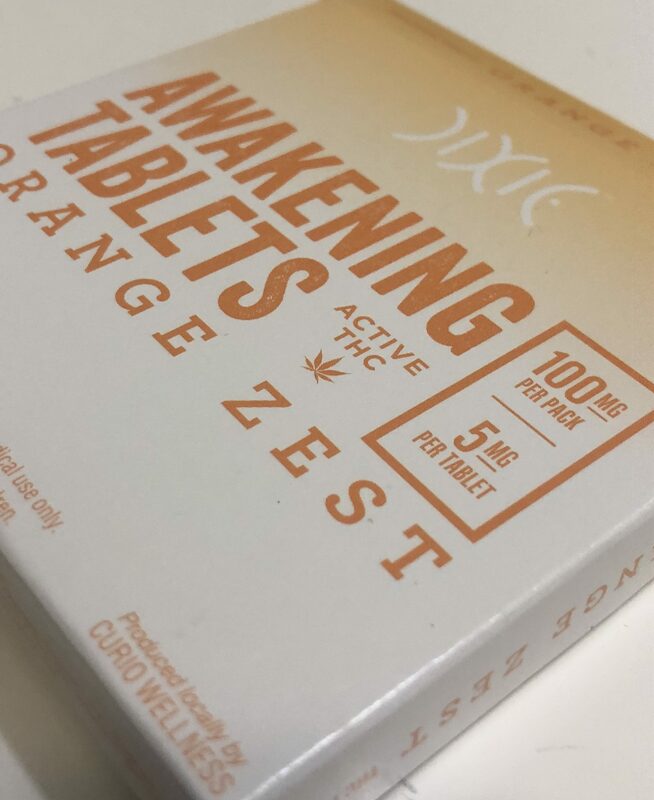 Overall, I’m really happy with the Dixie Awakening Orange Zest Tablets. I think it’s the first time I’ve got edibles from the dispensary and was like, ooh, yes, let me go back and get some more of those! The price seems fair, 20 tablets for $24, and you can get 60 tablets for $60, which brings it down to $1/5mg, or about $4 for 2-3 hours of relief from anxiety and depression where I can still get things done, but maybe not things that require communicating with other humans, which is definitely what I am, and not a time-traveling cyber-shark, as has been widely rumored. Curio also makes Dixie Relaxing Tablets, so I’m gonna check those out soon. Dispensary, Edibles, Maryland, Medical, Now Available. Bookmark.